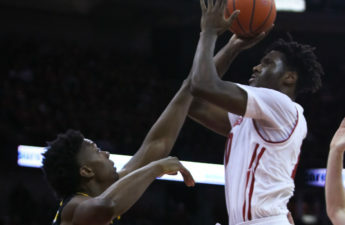 For one of the winningest classes in University of Wisconsin men’s basketball program history, Sunday’s 66-49 win over Minnesota on Senior Day at the Kohl Center provided a fitting end to the regular season careers of seniors Vitto Brown, Nigel Hayes, Bronson Koenig and Zak Showalter. The 111 wins the group has been a part of during their time as Badgers is now tied for second all-time among wins for a senior class. Only the 2013-16 class has accumulated more wins (115) while representing Wisconsin. Of course, these seniors will have a chance to break that record as postseason play begins next week at the Big Ten Tournament in Washington, D.C., where the No. 22 Badgers (23-8, 12-6 Big Ten) will be the No. 2 seed. On Sunday, the seniors carried the Badgers to a much-needed win after dropping five of their last six. Showalter and Hayes steadied UW early, finishing with 12 points each, while redshirt sophomore Ethan Happ nearly posted a double-double (nine points, 13 rebounds). When it was all said and done, the UW seniors accounted for 46 points, 17 rebounds, seven assists, four steals and three blocks. UW trailed by two at halftime, and Koenig had played just five minutes and attempted one shot in the first half due to early foul trouble. But 37 seconds into the second half, Koenig knocked down a 3-pointer to give UW a 30-29 lead – foreshadowing what was to come. Koenig drained another triple to tie it at 33, the start of a 10-0 run that would propel the Badgers to victory. Hayes, on his first 3-point attempt in four games, made one from behind the arc with 15:29 remaining, giving the Badgers a 36-33 lead. Happ converted the front end of a pair of free throws, before Showalter’s 3-pointer on the next possession upped the UW lead to 40-33. During the run, Minnesota (23-8, 11-7) was 1-for-6 from the field and scoreless for 3:23 before head coach Richard Pitino was forced to call a timeout with 13:58 left. “I thought we did not play an intelligent game today,” Pitino said. After a Minnesota bucket, it was D’Mitrik Trice’s time to shine. The freshman showed off with a personal 6-0 run, starting with a 4-point play after being fouled but still making his 3-point attempt. Brown then found Trice on the block for a layup, before it was Brown’s turn to do some inside damage by unleashing a furious one-handed slam that carried the frustrations he’s endured for more than a month. It was all part of an 18-2 run over five minutes and 28 seconds that saw Wisconsin take a 48-35 lead. Minnesota would get back within 6, but Hayes’ and-one with 3:30 left, and Koenig’s third triple at the three-minute mark made it 58-45. And Koenig wasn’t done yet. In his final act at the Kohl Center, he went on to add two more deep 3-pointers, finishing with 17 points on 5-of-8 shooting from beyond the arc. The lead grew enough that Wisconsin head coach Greg Gard was allowed the pleasure of removing the seniors with 28.7 seconds left — complete with a Hayes bow at center court — while the student section chanted “Thank you seniors!” as the final buzzer sounded. Wisconsin’s defense held a Minnesota offense that had scored 80 points in four straight contests to under 50 for the first time this season. Akeem Springs, who scored 16 points in the first teams’ first matchup this season, was scoreless. UW finished the game shooting 43.9 percent from the field, making half of its shots in the second half. The Badgers shot 55.6 percent from 3-point range (10-for-18), but still struggled at the free throw line (6-for-16). A 23.3 percent second-half shooting effort doomed Minnesota and allowed UW to make the game-deciding runs. To begin the evening, Hayes got off to fast start, scoring 5 points within the game’s first four minutes. 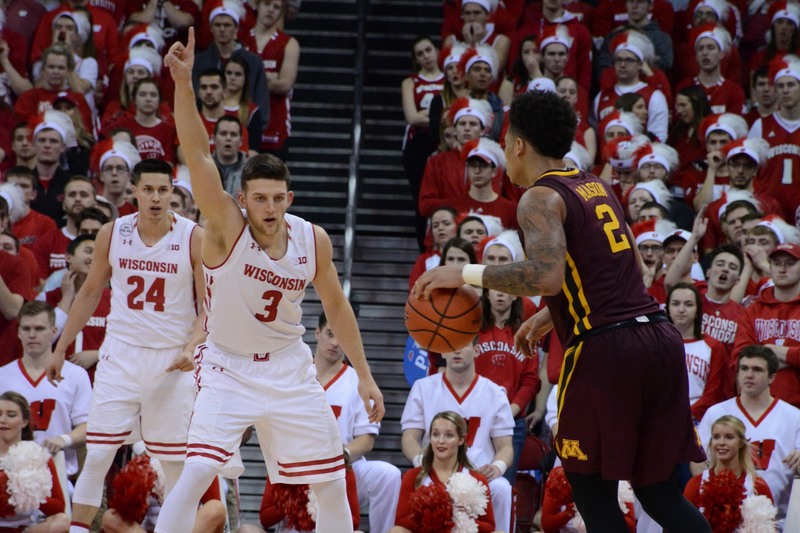 Minnesota then took advantage of a Wisconsin scoring drought, an Achilles heel of late for UW, going on an 8-0 run over a span of three minutes early in the second half. Over a six minute-plus stretch, the Badgers scored just 2 points – a Happ tip-in off his own miss. Luckily for UW, Minnesota didn’t do much scoring either. The Gophers largest lead never grew to more than 6. UW countered with a 7-2, with layups from Happ and Trice before Brown nailed a 3-pointer from the left wing with 6:02 left in the half to solicit an eruption from the crowd and force Minnesota to burn a timeout at 20-19. 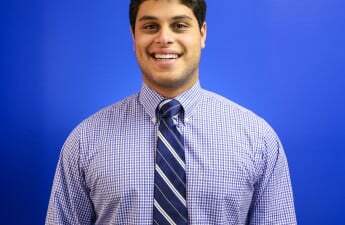 “Ethan kicked it out to me and I heard him say ‘Come on, V,’ so I had to knock it down at that point, couldn’t let him down,” Brown said. Following a Minnesota score, a Hayes two-hand slam made it a 1-point game again, before a Happ hook shot gave UW its first lead since the 15:35 mark of the half. During that stretch, UW made six shots in a row, with Happ converting four straight attempts after missing his first five. Minnesota jumped back out to a 4-point lead, and took a 29-27 lead into the half, but the Badgers outscored the Gophers 39-20 in the second half. UW has now won seven straight over Minnesota.